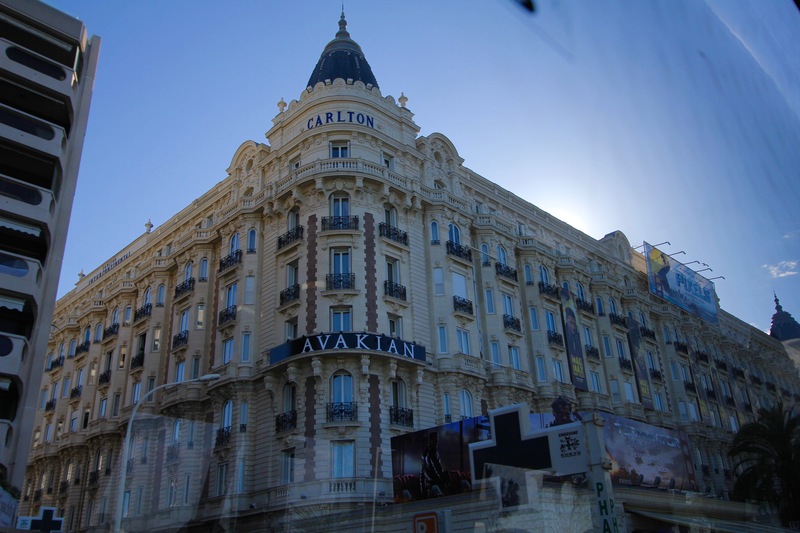 In a city that is most famous for its annual international film festival, make no mistake about it, you are in the middle of the French Riviera! In French, the Côte d’Azur (literally meaning the Azure Coast) or in English, referred to as the “French Riviera” it is easy to see the reference to “Azure” which is a variation of blue, described as “sky blue”. The French Riviera is the section of the Mediterranean coastline of France, including the country of Monaco, stretching westward to Saint-Tropez, Toulon, and includes the seaside town of Cannes with the largest city being Nice. This area of France has its own microclimate due to the French Alps to the north and the sea to the south, meaning that there are nearly 300+ sunny days per year. The French Riviera, stretching from the Italian border to the east, going westward to Toulon, France. 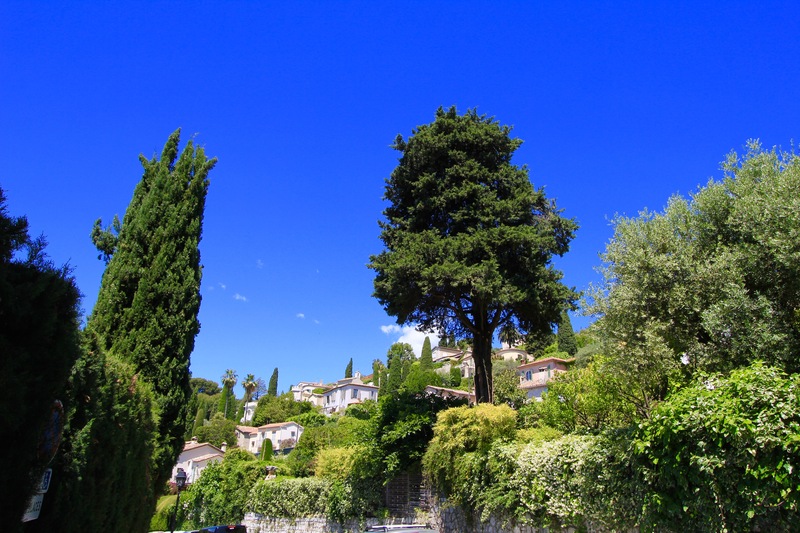 With its year-around sunny, warm weather and the shear beauty of this landscape, the French Riviera has been popular with tourists for hundreds of years. 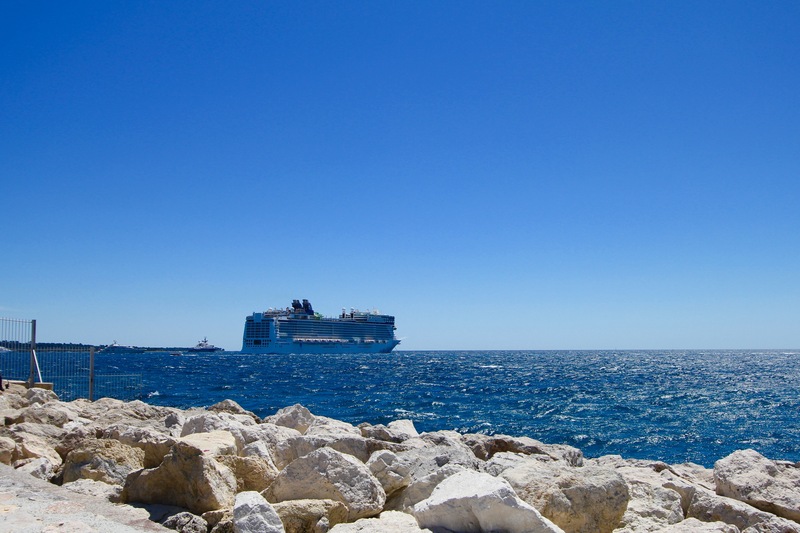 Our visit to Cannes was as a port of call on our recent cruise out of Rome we took in May. 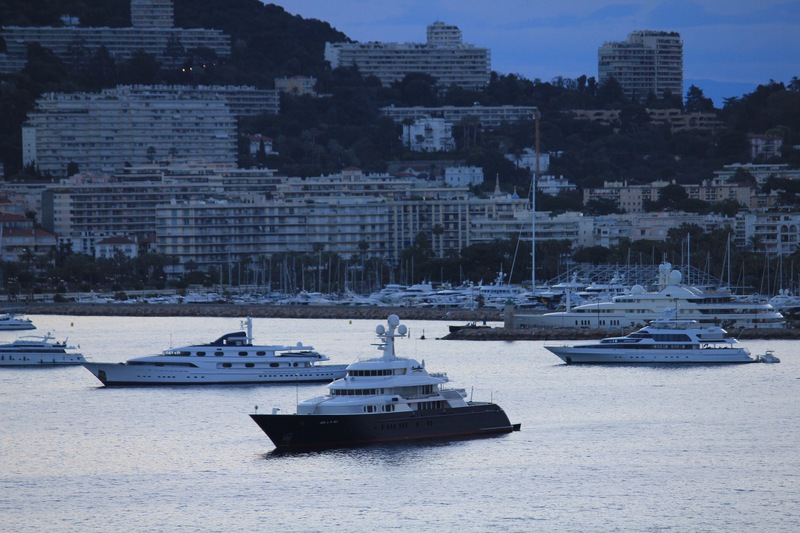 Upon arriving to the bay at Cannes just before sunrise, we were greeted by quite literally hundreds of very large yachts docked nearby. While I imagine yachts here are common, the reason for so many was due to the fact that when we arrived the Cannes International Film Festival had just started (not to mention the Monaco Grand Prix was also scheduled to happen the next day). Anyone who is a who’s who of Hollywood was in Cannes, and I am sure some extremely famous people were aboard some of these yachts. View of the many yachts as our ship approached Cannes. 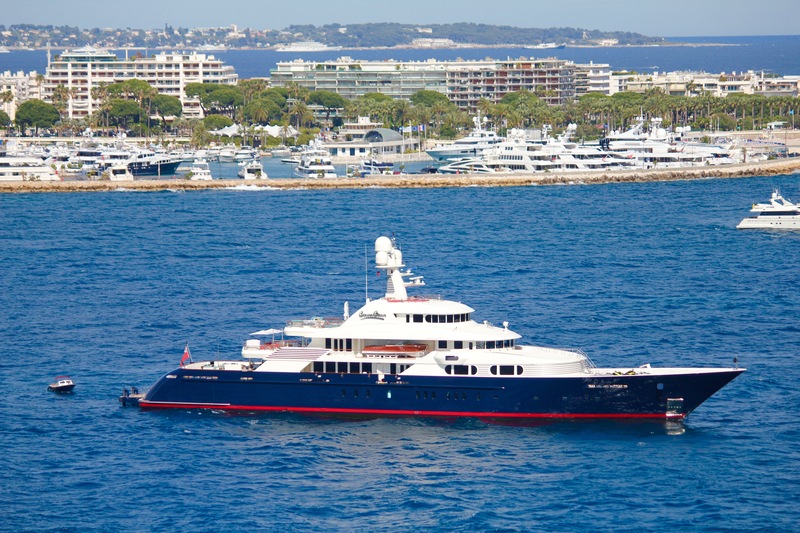 One of the larger yachts we saw in the bay at Cannes…so large that it had its own smaller boat docked on board and a heliport on it bow. 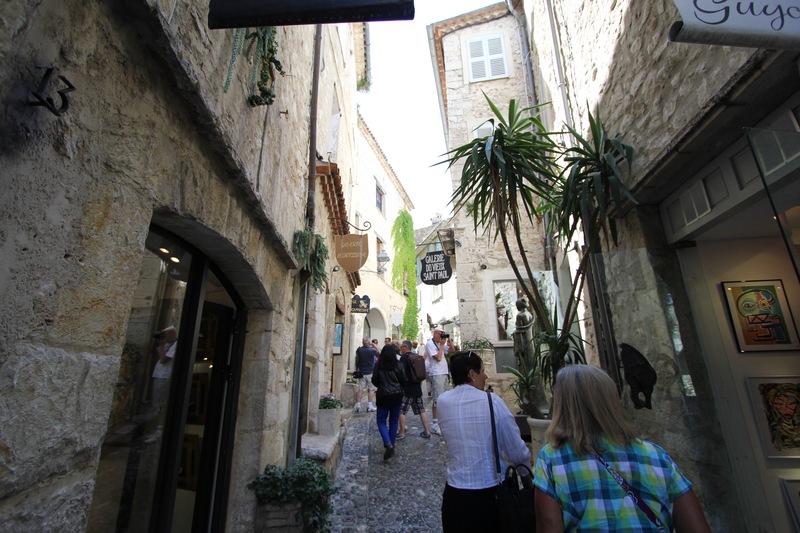 For our excursion today, Amanda wanted to go to the nearby town of Antibes to do some shopping, while I ventured off to visit the medieval village of Saint Paul. 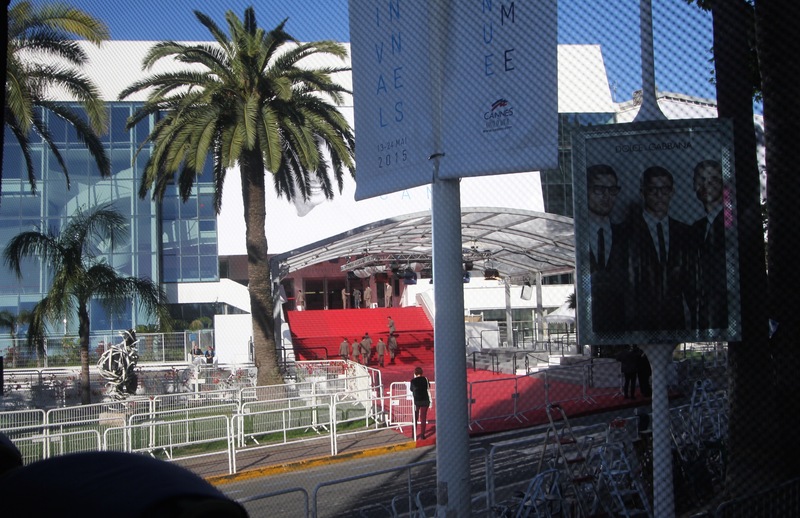 Admittedly, if I had known the Film Festival was occurring, I would have just walked the beaches and streets of Cannes to stalk famous people. This would have been my alternative to visiting St. Paul…to stalk the stars as they walked the red carpet. As far as Antibes goes, I can report that this town is very charming with lots of shopping opportunities from those with an expensive taste to those more of modest means. Amanda found a nice little boutique jewelry store and bought some handmade pieces there. 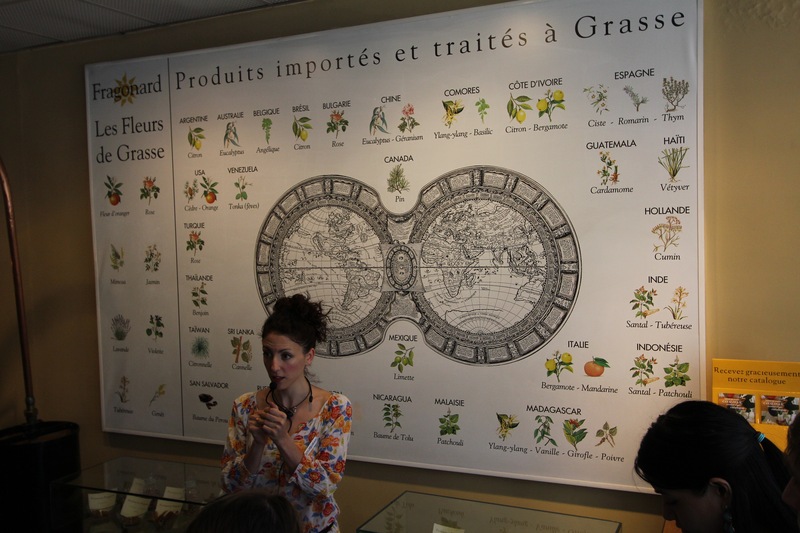 I, on the other hand, visited the perfume factory of Fragonard, and learned how expensive perfumes and soaps were made. This visit was included in my excursion package, and honestly my expectations were exceeded with this tour from a learning standpoint. Like, I had no clue that nearly 250 types of flowers and oils can go into just one perfume scent. And, the smells coming from the factory were very overwhelming, but in a good way. Of course, I took this as an opportunity to score some brownie points with my Mom and sister, buying them gifts for both their upcoming birthdays in June. 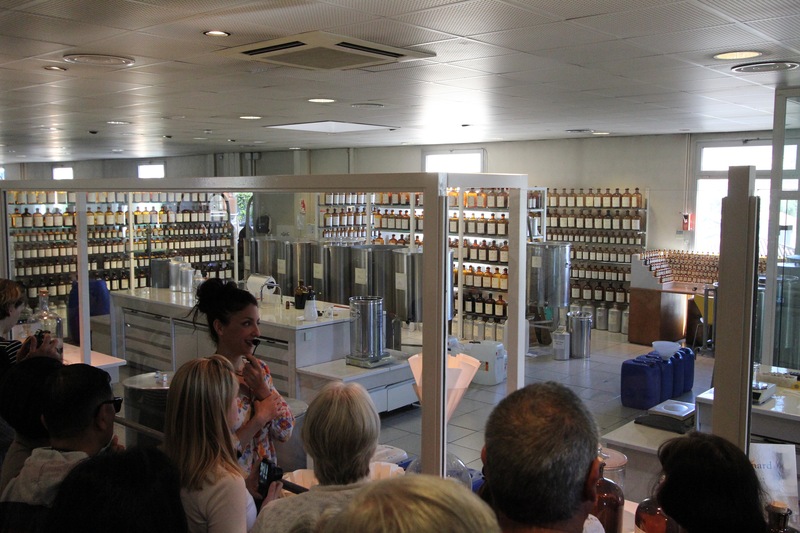 At the Fragonard Perfume Factory in Grasse, France, with our guide explaining how flowers & spices from around the world are used in the making of perfumes and soaps with some taking up to 250 different types just for one perfume scent. In this section this is where the professional perfumer or “nose” (in French “le nez”) work to combine the many different ingredients to make a batch of perfume or soap. It should be noted that factories like this make and sell the perfume in plain packaging, but the same perfume is sent to companies like Chanel for their packaging and adding probably $100 if not more to the cost. At the end of the 20 minute tour, you end up in the gift shop (imagine that) to purchase a selection of perfume, soaps, lotions, etc. 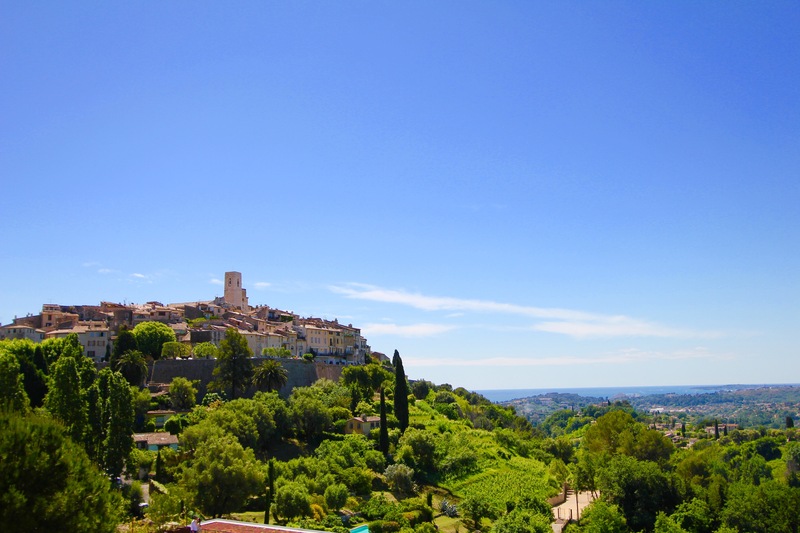 After leaving Fragonard, we then journeyed for almost an hour to the medieval village of St. Paul de Vence. 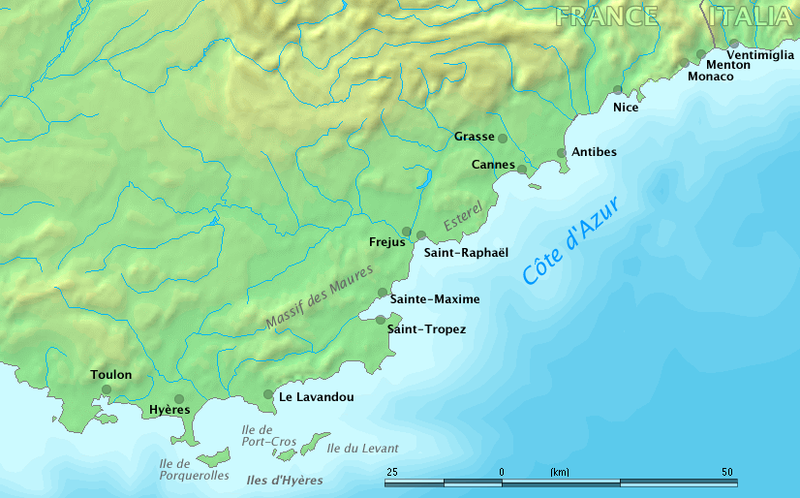 This area was settled by Romans in the 3rd Century BC, and later became a border town of the French region of Provence when this area became a part of France. 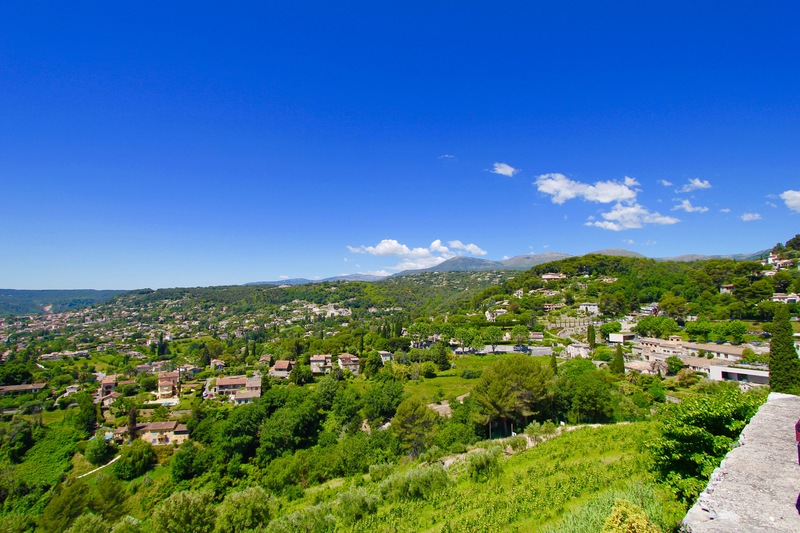 Being in the foothills of the Alps with its elevated vantage point, from St. Paul you can see the valley below as it stretches down toward the Mediterranean Sea. 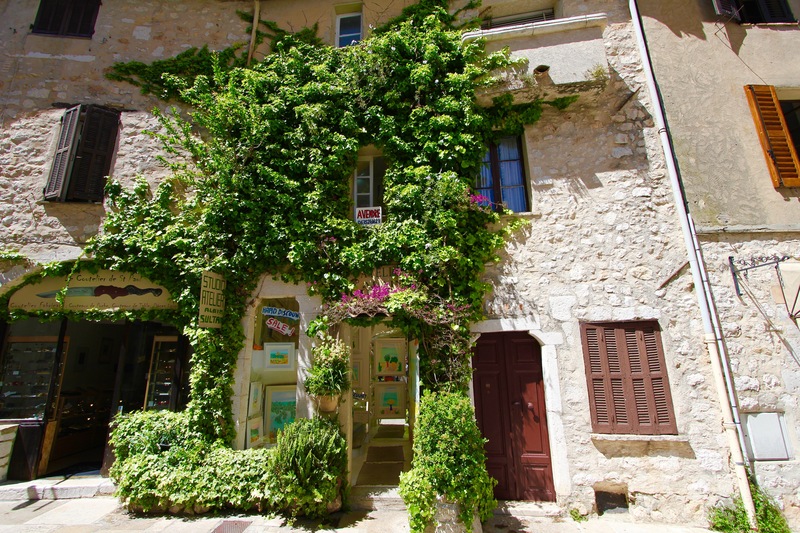 The village of St. Paul de Vence was originally settled by the Romans in the 3rd Century BC. 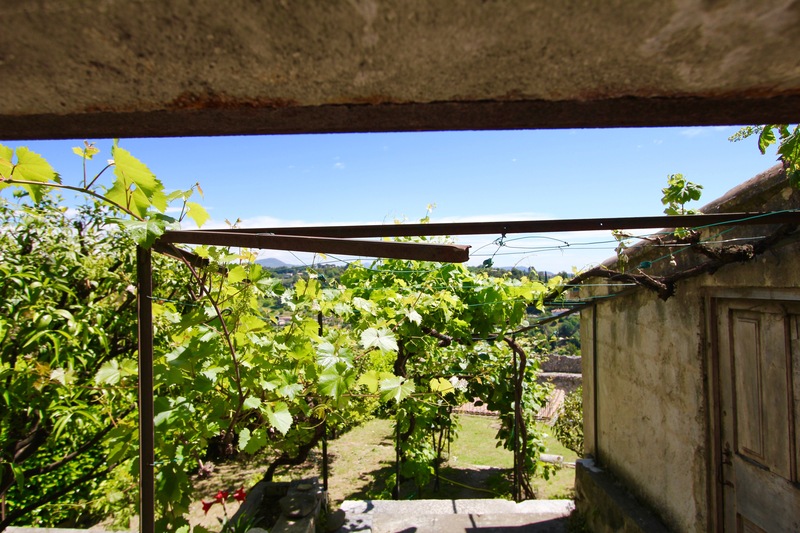 Over time, the village grew…the walls to protect the village was constructed in the 14th Century. The village is lined with narrow, cobblestone streets with people still living in the homes and operating store fronts along the main walkways. To be self-sufficient, some homes in St. Paul have their very own grape vines for wine making. We did learn that this small town was and is very famous as a haven for artists due to the inspiration they receive from the views. So much so, that even today, the famous will stop by to visit, as was evident by a charity event held just the evening prior here by Antonio Banderas and Eva Longoria. Nothing like getting lost in a village away from tourists to find postcard areas like this. 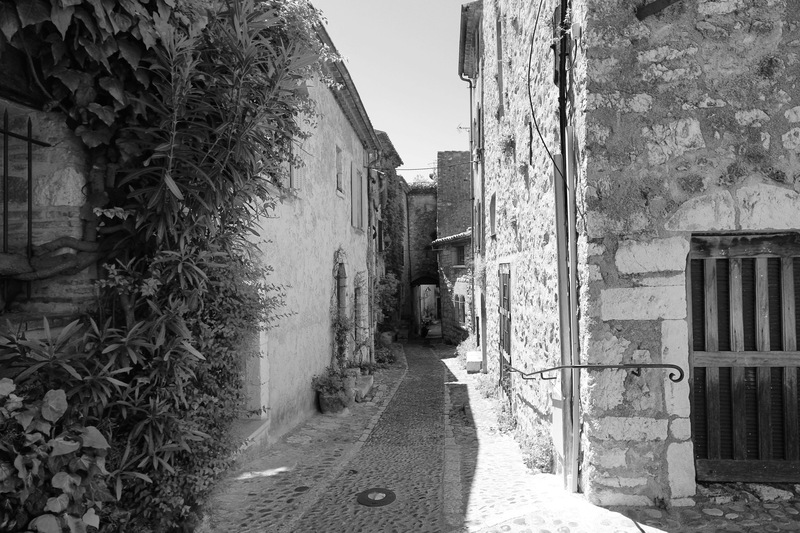 Or making a picture black and white to determine if it is the year 2015 or 1315…no cars are allowed within the village walls. Many famous artists have lived here with the views of the elevated village and distant views of the Mediterranean Sea as inspiration. Probably one of the most famous artists (who is buried here) is Marc Chagall. After spending nearly two hours in St. Paul, we left for our hour drive back to our ship in Cannes. Whether one chooses to stay in Cannes along its beaches, to visit Antibes for some shopping, or to see the historical site of St. Paul, Cannes and the nearby area has a lot to offer…and who knows….you may just see someone famous!!! Our cruise ship docked out in the bay. We were too big and had to take the tender boats to and from shore.